Gun violence in movies is more prevalent than ever, with portrayals of gun violence in PG-13 movies doubling over the past decade. This casual rise in cinematic violence will have frightening off-screen repercussions, say scientists: According to a JAMA Pediatrics study released Tuesday, young children who are exposed to gun-wielding movie characters tend to be a lot more cavalier with guns than society is comfortable with. In the paper, Ohio State University and Wittenberg University scientists Kelly Dillon, Ph.D., and Brad Bushman, Ph.D., write that their experiment revealed that children who watched movie characters use guns were more likely to handle and pull the trigger of a disabled gun they were later exposed to. Violent movie watching was associated with a higher rate of trigger pulls, longer time handling the gun, and more aggressive play. “The connection shown in this experiment is a compelling start to a broader conversation on the various factors that can increase a child’s interest in guns and violence, including gun violence in movies,” Dillon and Bushman write. In this experiment 52 pairs of children, roughly half male and half female, were randomly assigned to watch one of three 20-minute, PG-rated clips: Either a scene from the gun-free 1991 film The Rocketeer, a scene containing guns from the Nicolas Cage classic National Treasure, or the same scene from National Treasure, but edited to remove the guns. After watching the clips, the kids reported how much they liked the clip, then they were left to play with a variety of toys for 20 minutes in a closed room. Among the toys were Lego bricks, Nerf guns, and a real 0.38-caliber handgun that was modified so that it could not fire. The researchers hid the gun in a cabinet drawer in the room, then they stepped back and watched the kids, via hidden camera, as they played. 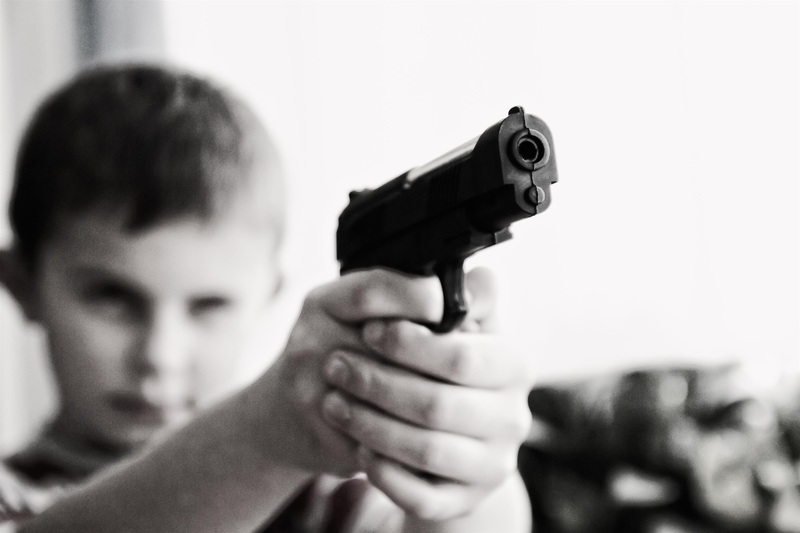 Children acted more aggressively after watching movies with guns. The researchers discovered that seeing a movie clip containing a gun didn’t have any effect on whether kids found and touched the gun. 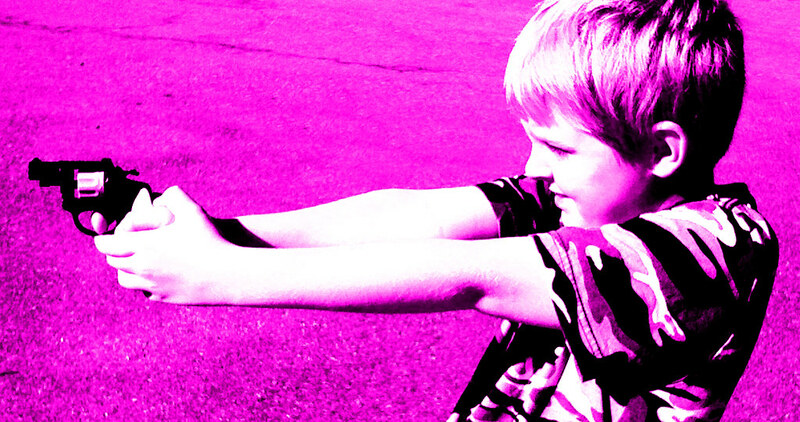 What it did have an effect on, however, is what kids did with the gun once they had it. The median number of times kids who watched movies with guns pulled the trigger was 2.8, while it was 0.01 for kids who didn’t see those clips. Children who watched clips with guns also spent more time holding the gun, averaging at 53.1 seconds. Meanwhile, kids who didn’t watch clips with guns held the gun for an average of 11.1 seconds. There's more gun violence in the top PG-13 movies than R-rated ones. This study is particularly troubling when taking into account research that has shown a consistent rise in violence in the top-grossing PG-13 movies, surpassing even the amount of gun violence in R-rated films. This year, authors of an Annenberg Public Policy Center analysis of violent movies noted an extremely disturbing aspect of this trend: The higher frequency of gun use in PG-13 movies didn’t necessarily mean those movies more frequently showed the consequences of using guns. These films essentially erase much of the blood and suffering that comes with violence, creating a very unrealistic portrait of what using guns really looks like. That’s a problem, especially when you consider the horrific fact that children in the United States are 10 times more likely to die by unintentional gun shootings than children from other developed countries.